Location: 8471 North Coast Highway, Laguna Beach. From the 73 freeway, take the Mac Arthur exit (the last one before it becomes a toll road). Take Mac Arthur 3.2 miles to its terminus at North Coast Highway. Turn left (south) and go 4 miles to the park entrance, on the left. From Laguna Beach, take Coast Highway north for 2.8 miles and the park entrance will be on your right. From downtown Huntington Beach, the park is 12 miles south on Pacific Coast Highway. Parking fee is $15 per day. Crystal Cove State Park may be best known for its beaches and marine geology, but there’s a lot to check out in the back country. On the inland side of Pacific Coast Highway, the park has dozens of miles of trails to explore. The moderate hike described here is sometimes called the “Red Route” (there’s an easier “Green Route” and a more challenging “Blue Route” as well.) From the entry station, drive down to the newly built campground and day use area (follow the signs). 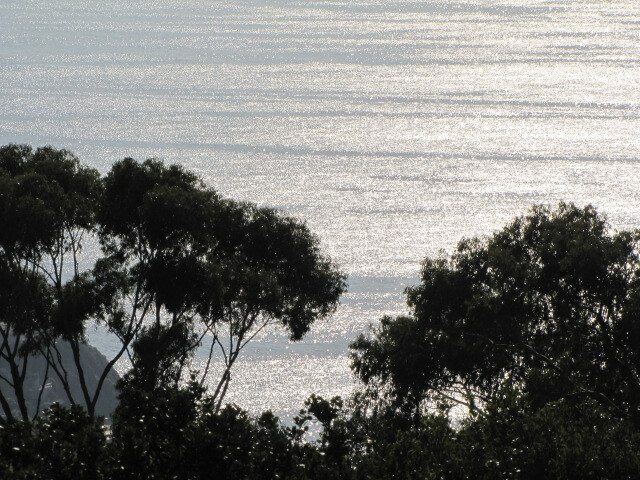 At the back of the parking lot, begin walking across a large footbridge into El Moro Canyon. Stay straight as the B.F.I. trail (your return route) comes in from the right. 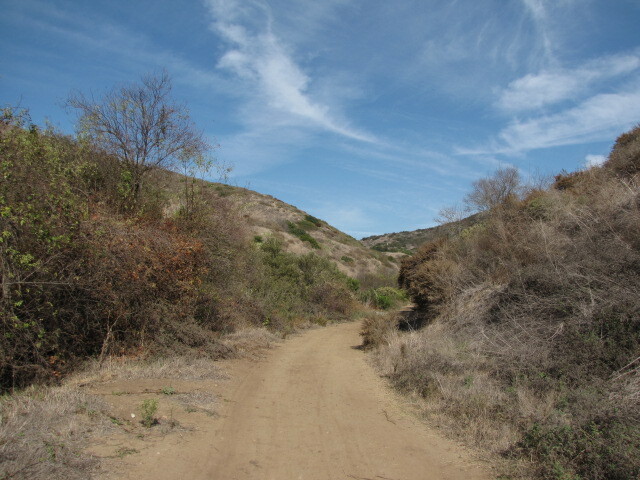 The first mile through El Moro Canyon is pleasant and more or less level. The hills on both sides block out much of the noise of the highway nearby. Shortly after crossing the canyon, you head right on the East Cut-Across. That this trail has been nick-named “I Think I Can” should clue you in to the fact that you’re in for a little bit of a climb. Fortunately, the views get better and better as you ascend, and in a mile, after climbing about 600 feet, you arrive at a triangle-shaped junction. Go right (south) onto El Moro Ridge Road, toward the ocean. After about three quarters of a mile, head straight on a short spur that leads to the Emerald Vista Point. Unfortunately, you have to share this spot with a communications antenna, but the views – Dana Point to the south, Catalina Island straight ahead and the Palos Verdes Peninsula to the north – are great, especially if the air is clear. When you’re done enjoying the scene, retrace your steps and head left (southwest) on the El Moro Ridge Trail. It soon starts to descend steeply, giving good aerial views both of the canyon and the beach at Corona Del Mar. After a mile, head right on the B.F.I. trail. What exactly those initials stand for depend on whom you ask, but the polite version is Big Fat Incline. Your hiking poles will be your B.F.F. on the B.F.I. trail, as it makes a steep dip near the end, crossing a footbridge and completing the loop. Head left, across the larger bridge, and back to the campground. While the day use fee of $15 is higher than that of most state and county facilities, Crystal Cove State Park has a lot to offer. Unlike the other state parks of Orange County’s coastline, Crystal Cove has an extensive back-country as well as miles of beaches (included in the price of admision). If you make the trip with several friends, you can split the cost. Either way, it’s still a lot cheaper than Disneyland.